Added (Initially) - When an observer is created for the first time, it’ll fetch the initial set of documents from MongoDB and trigger this event for each document. Added - If a new document satisfies the query, then the observer will trigger this event with that document. Updated - If there is a change to an already added document, then the observer will trigger this event with the changes. Removed - If an existing document does not satisfy the query, then the observer will trigger this event with that document’s ID. 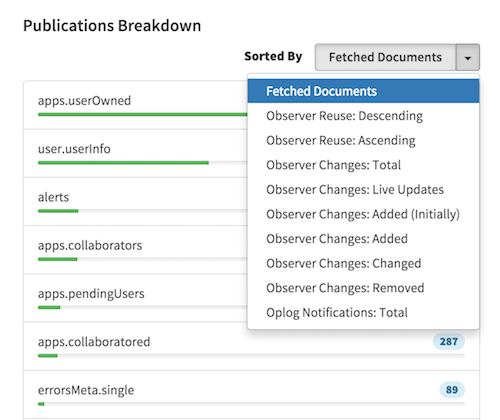 Meteor watches the MongoDB oplog to observe changes happening in the MongoDB. If something happens in the DB, Meteor will receive it as a notification. The notification is attached to a collection. Then, Meteor will forward this notification to most of the observers created for that collection. Meteor will receive all these notification regardless of whether it has a related observer or not.